Pandora’s Promise producer: Nuclear energy is necessary to fight climate change. Bobby Kennedy Jr. calls it “an elaborate hoax,” but scientists are on my side. 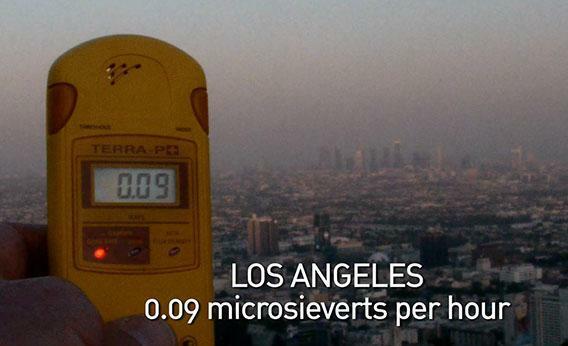 A geiger counter records the radiation level in Los Angeles in a scene from Pandora’s Promise. I am not alone in thinking that next-generation nuclear energy is an essential part of the solution to protect future generations. The film has received vigorous support and factual verification from the scientific community. There are a growing-number of liberals and greens who feel the same way. After seeing my film in the months since it premiered at the Sundance Film Festival, Virgin’s Richard Branson and Microsoft co-founder Paul Allen, came on to the film as executive producers to aid in the film’s visibility and distribution. Jeffrey Sachs, Bill Gates, James Hansen, James Lovelock, and President Obama have all spoken out in support of nuclear energy. Hansen, a respected climate scientist and an advocate for next-generation nuclear power, recently published a scientific paper showing that nuclear energy has actually saved more than 1.6 million lives, by displacing coal. Advanced nuclear technology is among the most important non-CO2-emitting technologies that are currently ready to be deployed, if only we can come to terms with its complex and troubled history. That’s what this film attempts to do. It’s important that we examine the facts surrounding nuclear energy as well as the almost unfathomable energy dilemma we face in providing clean energy to a world inhabited by 9 billion people by the middle of this century. Those who are against this film want to convince you that we’re on track to solving this problem with renewables and energy efficiency alone, and that we simply need to stick with the program. The problem we face today is that what we’re doing now to combat climate change is simply not working. We need to immediately begin to deploy a diverse range of non-CO2-emitting energy technologies, including lots of wind, lots of solar, lots of efficiency—and yes, lots of nuclear power. Pandora’s Promise attempts to expand the debate about our energy options by offering up a solution that until now has been obscured by myths, falsehoods, ideological dogma, and political polarization. Those who don’t want you to see this film have dominated the discussion for the past 40 years. I’ve seen countless anti-nuclear documentaries. I was even nominated for an Academy Award for a film I made about the nuclear weapons testing, Radio Bikini. I, like the key people I profile in Pandora’s Promise, have been deeply immersed in the anti-nuclear view of the world for decades. We are all passionate environmentalists. All of us in our own individual ways have come to realize that much of what we believed about nuclear energy was flat-out wrong. Climate activist Joe Romm recently urged his readers to follow his example and simply not bother going to see the film. This didn’t stop him, of course, from launching into a lengthy critique of it. One has to wonder why certain activists and environmentalists are encouraging the public to avoid a film about climate change simply because it questions the ability of our limited, and thus far failed, efforts to solve the problem. As long as people like Romm use their positions of influence to determine what can and cannot be said about our predicament, to claim uncompromising ownership of the issue, we will never muster the political coalitions required to face this momentous challenge squarely and effectively. During a public debate I had recently with environmental activist and solar energy executive Bobby Kennedy Jr. at the Jacob Burns Center in Pleasantville, N.Y., he denounced the film as “an elaborate hoax” and complained that the film isn’t fair, that it doesn’t tell the other side of the story. I beg to differ. The film lays out precisely, and very sympathetically, what all of us feared about nuclear power and why. It then profiles the reasons why we came to change our minds. As a documentarian, my responsibility is to illuminate the truth as I see it. What I will not do is to give precious screen time to people who continue to propagate misinformation with no basis in scientific fact. During our debate, Kennedy displayed the same disregard for facts and peer-reviewed scientific evidence surrounding our energy dilemma as he has recently done around the issue of vaccines. He claimed that because Germany for a few hours once powered its electrical grid with 50 percent solar energy, this is proof that solar energy is poised to replace fossil fuels. The truth is that after a $130 billion investment in solar energy, Germany averages 5 percent solar. But Germany is also building more coal plants while shutting down its nuclear fleet, leaving its CO2 emissions relatively flat for now. What they’ve achieved is remarkable and it is to be applauded. But it is far from the game-changer that Kennedy, Bill McKibben, and others make it out to be when they exaggerate the German experiment with renewable energy. Kennedy then repeated the canard propagated by Helen Caldicott (which is a key scene in the film) that Chernobyl killed nearly 1 million people—proving, therefore, that nuclear energy poses an apocalyptic threat to human health. When I pointed out that the definitive U.N./World Health Organization report on this worst-ever nuclear disaster found fewer than 60 fatalities thus far, with a projected 4,000 who may suffer premature mortality (all cited in the film), his retort was that the World Health Organization was somehow compelled by the nuclear industry to cover up the truth. Kennedy has made similar widely debunked claims about the Centers for Disease Control and Prevention and leading figures in the medical community with respect to vaccines. This is from one of the most respected environmental and anti-nuclear leaders in our country! Who among those who now criticize my film for being one-sided complained that Al Gore didn’t include in An Inconvenient Truth the arguments of climate change deniers, people who believe global warming is similarly a hoax perpetrated by the United Nations and money-grubbing climate scientists? What I’ve noticed in screening this film around the country is that there is a generation split. Young people get it. They understand what’s at stake and aren’t beholden to outdated ideologies and paranoid conspiracy theories that took root during the Cold War. As more and more people see this film, it is my hope that more courageous and reasoned environmental leaders will step forward and speak publicly what many of them now hush quietly to their friends, which is that nuclear power will be needed if we’re serious about solving climate change. The vestiges of the anti-nuclear movement, and those who continue to believe them, cannot be allowed to stifle this critical debate before it even gets started. If so, they will declare victory, CO2 emissions will continue their accelerating rise, and we will drift ever closer toward disaster. Whatever you think about the issue, I hope you will consider coming to see Pandora’s Promise for yourself in cinemas around the country and participating in this debate.